My trip to the capital of Laos had been planned for more than a year, thanks to acquiring some ultra-cheap tickets in an AirAsia seat sale. As a country though, I had wanted to visit Laos for some time, but never really found the right opportunity. Most tourists head north to Luang Prabang, which seemed like a good reason to stay and explore Vientiane, or Vieng Chan as it’s known locally. I don’t like making an early start to my day. However, with a 7:35am flight time, I had no choice but to be up before 5am. That wasn’t my original plan, but AirAsia changed the flight times after I’d booked … reducing what should have been a three day vacation into little more than a day and a half. The state of KLIA’s Low Cost Terminal did nothing to improve my mood. There is now a new international departure lounge, with just two gates. It’s wrong to call it “new” because it seems to have been hastily converted from a garbage dump! It doesn’t even have its own washrooms. And from there I had to walk in unlit outdoor corridors to the plane. I asked the poor girl who was trying to check boarding cards in the dark if this was the “bring your own candle flight” but her response made me realize she was no more of a morning person than me. You’d think AirAsia could afford a few flashlights, but maybe the airline’s headed in the same direction as India’s Kingfisher. Things improved once on board. The cabin crew had a sense of humor, and the safety announcement was full of chuckles. Like … “If you can’t find your seat belt, you’re probably sitting on it.” That raised a giggle or three. The comment “Please put on your own mask before assisting children, or any adults acting like children” seemed to go over everyone’s head, but being advised “This is a non-smoking flight, so if you need to smoke, please go outside” seemed to amuse everyone. Luckily no one took their advice! Vientiane’s International Airport is small, but clean and modern. Not handing out landing cards during the flight caused minor chaos, as everyone had to complete those, and Visa application forms in the small Arrivals Hall. The US$42 Visa fee sort-of takes the edge of the “Welcome to Laos” greetings. The hotel thoughtfully met me at the airport, and the 4km ride to the city center was completed in minutes. My first impressions were that Vientiane is very similar to a small Thai city. Come to think of it, my lasting impression is no different. As capital cities go, this must be one of the smallest. You can cover most of it in one day, leaving you wondering what to do with the rest of your stay – but I’ll come back to that later. The place is kind-of grubby, but caused more by the climate than the people. In fact just about every establishment seemed to have a trash can outside on the sidewalk, and as far as I could see, everyone used them. But; I’d chosen to visit in the dry season, which meant dead leaves and dust everywhere. The latter seems to rise up into the air, making the sky very hazy at all times. I enjoyed my two-night stay at the AV Hotel. It’s clean and pleasant, has helpful and courteous staff, and is centrally located. But I probably wouldn’t choose it again, as it’s quite short on facilities. The restaurant only serves breakfast – a reasonable buffet, with freshly-brewed, delicious Lao coffee – but some days, after a lot of walking, it’s easier just to wander to your hotel’s Coffee Shop, for a simple meal and several muscle-relaxing beers. My plan for Day 1 was to walk around the city and see as much as possible, as I had something different planned for Day 2. I started with a 1km hike to something called Patuxai, roughly meaning Victory Gate. 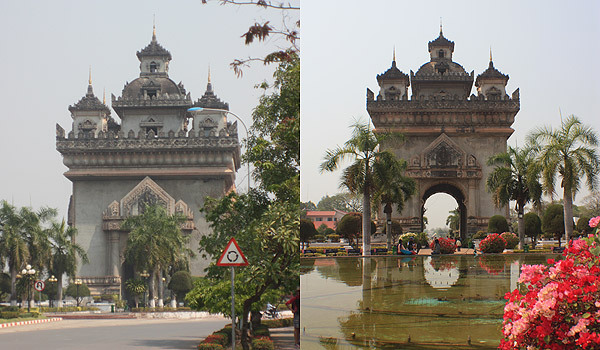 It’s Vientiane’s equivalent to Paris’ Arc de Triomphe. Let’s just say, it’s worth seeing, but from a distance. The monument was built using American funds, and in the 1960s cement actually originally intended to build an airfield during the Vietnam War, was used in the structure. 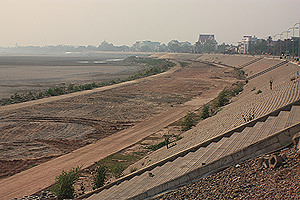 The United States had given Laos money to build a new city airport. 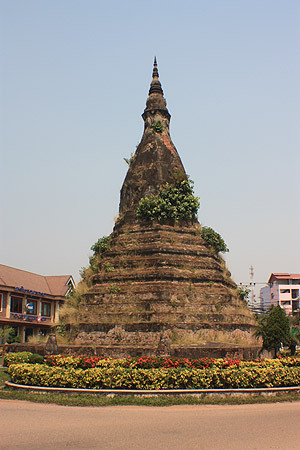 However, the Laotian government of the day used the money to build the monument instead. As a consequence, the monument is sometimes referred to as the “vertical runway”. Patuxai, Victory Gate, or Vientianne's Arc de Triomphe. From there, I wandered back towards the hotel, in search of lunch. En route, I stopped off at the Talat Sao Mall and a Morning Market, but couldn’t find much of interest. Wikitravel actually warns that it is a place for “dumped products from Thailand” most of which are fake. Later, I found a pleasant-looking restaurant, just a stone’s throw from my hotel, and next to a large stupa, known as That Dam, or Black Stupa. 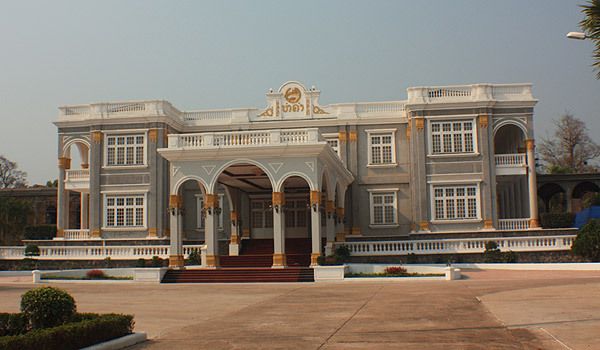 It’s believed to house a seven-headed snake, or naga, which supposedly tried to protect the Lao people from the invading Siamese back in 1827. I can’t find out how old it is, but apparently it used to be covered in gold. That would be an improvement. After a very cheap meal of salmon fried rice I began to realize how tired I was, and how hot it was becoming. While I was there the skies were cloudless, and the temperature hit 36 degrees each afternoon. With low humidity and dust in the air, it was like walking around in a furnace. So, I did the obvious thing, and slept through the hottest part of the day. So many wats that I can't remember what wat is which! The wats (or vats in Lao) are everywhere … two or three to every city block. Most are worth visiting, as they can be quite differently decorated, but a few are kind-of drab. Most seem to feature a large covered entrance hall, which apparently distinguishes them from Thai wats. The Mekong turned-out to be a disappointment. In the dry season, the water is almost non-existent. It looks like it could be half a kilometer wide in the wet season, but at this time of year, that half-kilometer is just sand. Some years ago, I looked across from the other side, in Thailand, and it was the same vast expanse of sand. No matter. 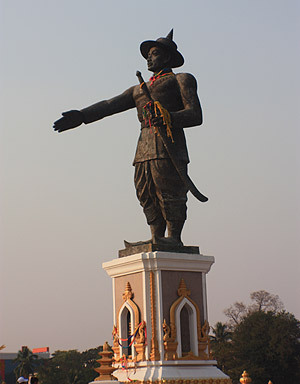 I wandered some distance along the not-much-waterfront, visiting more wats, a street market, and a statue of Chao Anouvong, the Lane Xang kingdom’s last monarch. 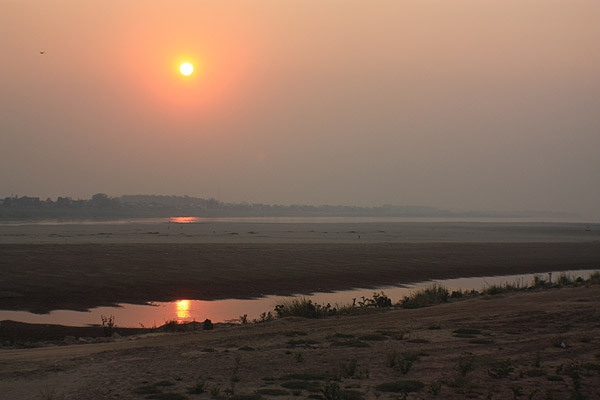 After watching the sunset over the Mekong puddle, I headed back to the hotel. Following a much needed shower to remove the many layers of dust, I was ready to eat. I’d seen several restaurants near the Black Stupa, just half a block away, and found a nice outdoor, casual place, attached to the rather pretentiously named “Château du Laos” hotel. It was plain wooden benches and tables, which was just fine with me. Fried egg noodles with pork and a variety of vegetables was sandwiched by a pair of large bottles of Beerlao, the local brew. This is good beer! I could live on the stuff. By about 9pm, it was much cooler and pleasant, almost a Mediterranean climate. It seemed I was lucky to pick a restaurant that didn’t close at nine, as most other places were winding down, and the quiet back street became almost silent. I wandered back to the hotel at around ten, just before they rolled up the sidewalks and packed them away for the night! An interesting, hot, dry, dusty, tiring, but rewarding day. Day 2 was supposed to be quite different.